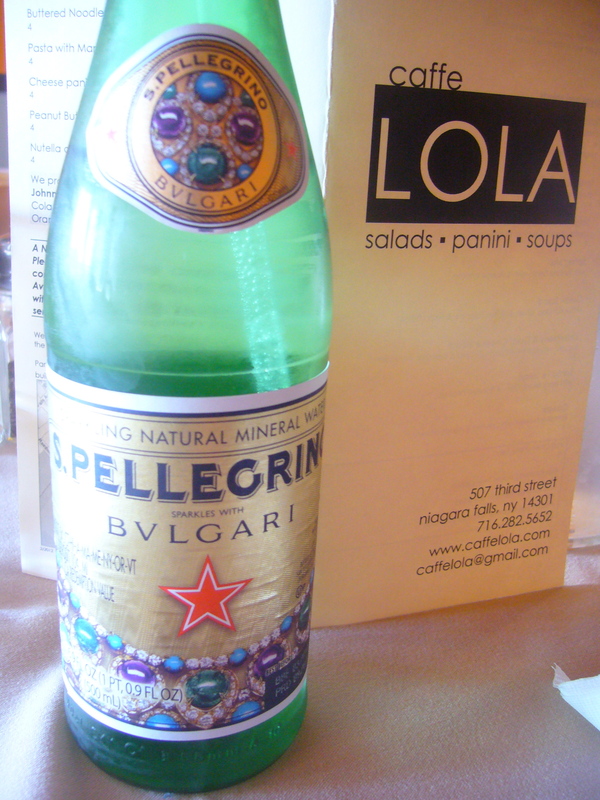 Eating lunch at cute Niagara Falls‘ NY Caffe Lola I enjoyed pouring my San Pellegrino from its limited edition Bulgari-designed bottle. The collaboration of these 2 Italian brands marked the 125th anniversary of Bulgari; a necklace from their latest collection adorns the label. The fashion pack city-hops & Style Eye brings you news from Milan. A mystical mood sums up the Gucci Fall Winter 2012 collection. The endless array of deep, brooding colors from the expected black to rich brown, forest green and burgundy paraded down the catwalk in a mix of velvets ( including devore), satins, leather, chiffons, brocades, jacquards & furs. 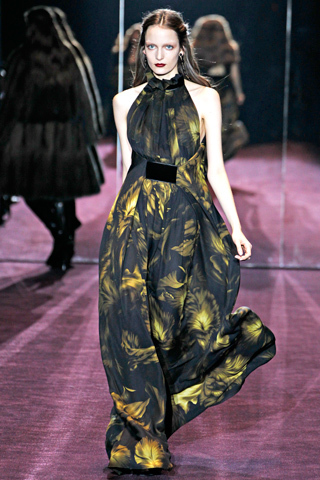 The opulence continued with a sprinkling of Asian flower prints on fluid silhouettes. The majority of the looks fell away from the body with the most fluid of fabrics. Minus a jodhpur pant in jacquard the collection was more evening than day. A few capes and short jackets made an appearance as did a series of wrap dresses, some with a riot of ruffles. As the final designs made their way down the catwalk, sheer chiffon ruled the looks. Slim dresses exploded in pleats with appliqués of heavy beadwork scattered across them. In all the collection was mystical with only the wrap dresses and the jodhpur pant off key.